Know what your Garden Room is made of and invest wisely. Advances in building technology and products have flown far further than traditional felt roofing from yesteryear. 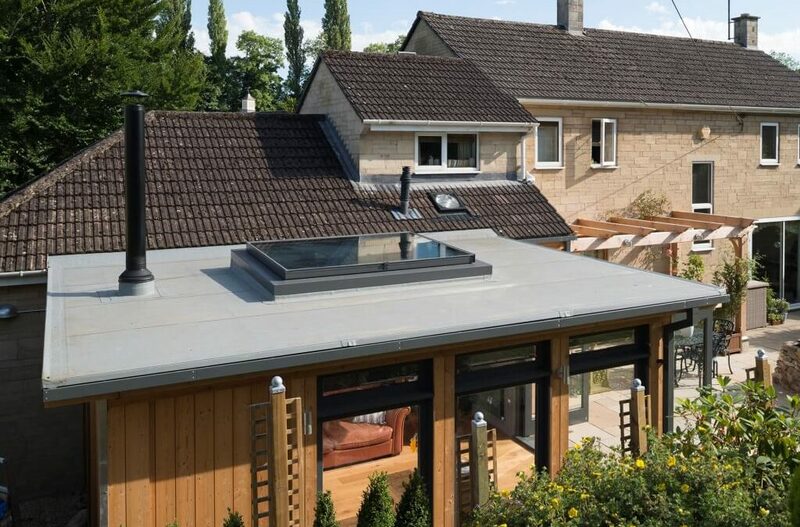 Modern flat roofs, done right, can be fantastically energy efficient and extremely durable. This is reliant on a well-designed roof structure that includes sufficient insulation and an up-to-date membrane system. Your roof gets all the abuse. While you’re tucked up in bed at night, your roof is getting attacked by rain, snow, ice, wind, algae, moss and more. All equally damaging! With this is mind, you wouldn’t knowingly just wrap it in paper and a bit of grit to protect it from the elements. This is effectively what roofing felt is. It’s a paper or fibre material with a bitumen and gravel layer and is traditionally known for failing rapidly. Felt, along with bitumen and asphalt have previously been the go-to roofing for speed and low cost and are perfect for sheds. Many people have heard horror stories about felt roofs eroding, cracking easily and rotting the roof before anyone notices. Common failure is down to a combination of a cheap material and sadly, shoddy installation. 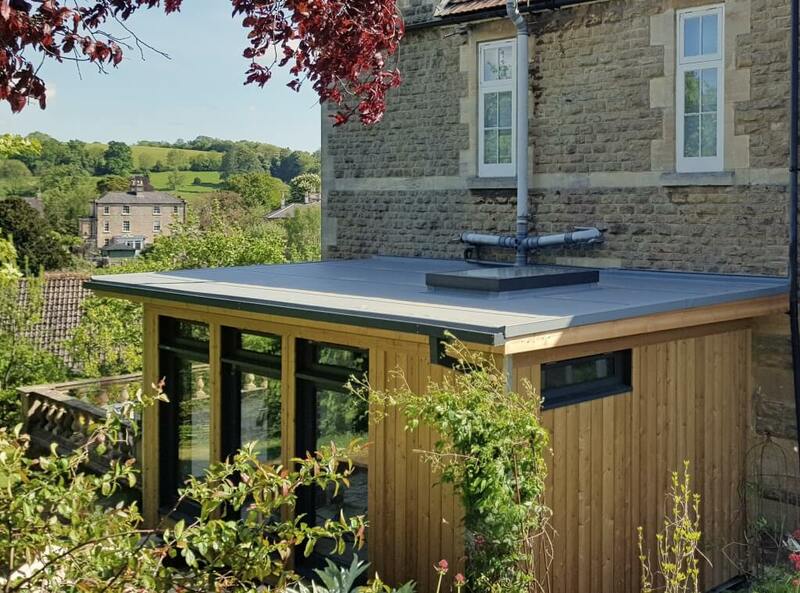 Realistically, roofs aren’t that exciting, and might not be the first thing you look at when choosing a building for your garden room or extension. Unfortunately, for this reason, it can be the first thing that’s compromised to bring the cost of garden rooms down. Make sure you know exactly what you are buying and that you are investing wisely in products that will last more than a few years. We wouldn’t felt our houses, would we?! 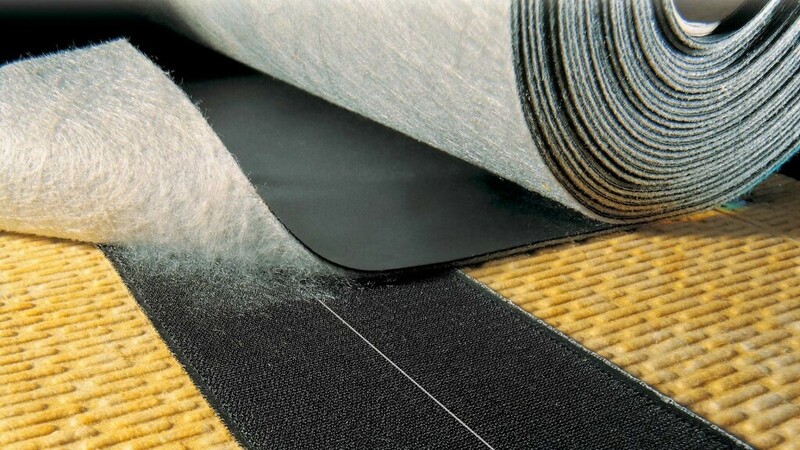 So, what’s the difference between a felt roof and a modern membrane? They are both used to cover flat roofs but that’s pretty much where the similarities end. Over the past decade flat roof systems have advanced a great deal to eliminate the common issues affecting older felt and asphalt roofing methods. There are rubber membranes (EDPM), PVC alternatives and several single-ply membranes available. We have chosen a top-spec single-ply membrane for our MOSSpod buildings called Rhepanol. A German product that has been in use and product development for over 50 years. Rhepanol is a synthetic roofing membrane with pre-fabricated self-sealing edging and fleece backing and, we believe, it is second to none on the market. We have chosen it for its proven outstanding overall Life Cycle Assessment durability, proven low level of environmental impact and its BBA certified life expectancy of at least 30 years. Rhepanol is laid in rolled sheets which are permanently welded at the seams. Once laid, it has a similar appearance to a lead roof and is perfect for sensitive areas such as Conservation areas and Listed Buildings. We have recently had a MOSS building approved by Conservation Officers in the centre of Bath, a World Heritage Site, which is quite an achievement for a modern material. You might not be staring at the roof of your garden room every day, but it’s one of the most important parts of a building. You need to be safe in the knowledge that it is performing perfectly for many years, without a second thought from you. That’s good design practice. No cutting corners. Cheap and cheerful is sometimes great for furniture and interiors that you might change in a few years’ time, but who wants to install a new garden room every few years! ?